An Indian citizen who hasn’t heard of Noida may as well be living in seclusion. Noida, also known as the New Okhla Industrial Development Authority, is a glorious urban center in Uttar Pradesh. With its excellent location systematically planned setup, this bustling city has become one of the major spots to settle and work at in the Delhi NCR. House hunting in Noida can be a challenging task. There are so many properties to choose from. 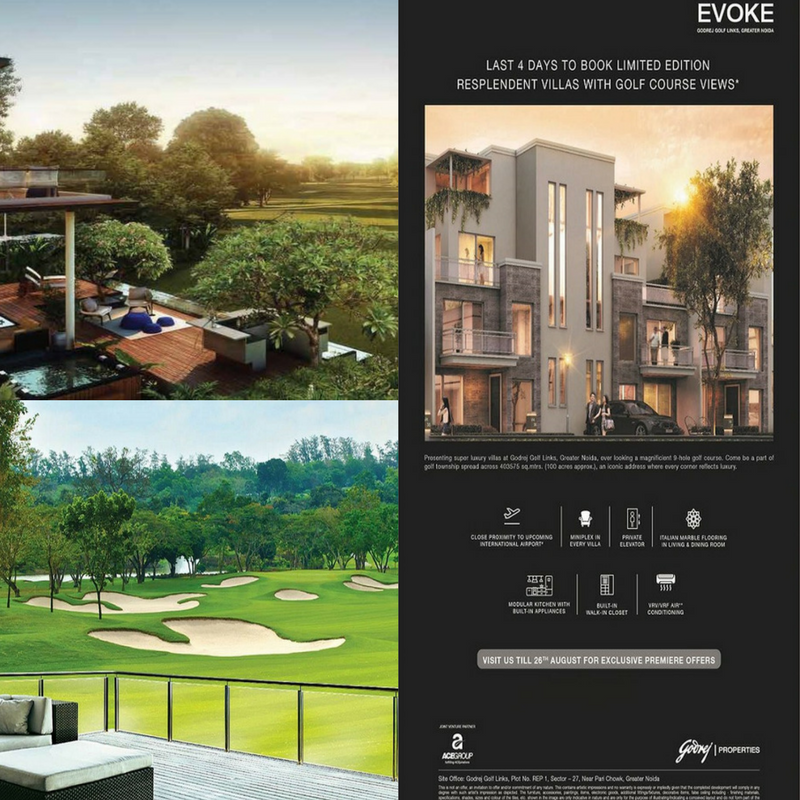 Surely, Godrej Evoke Villa will satisfy your need. With its luxurious villas and well-equipped facilities, living would feel like living in paradise! Its unique grandeur and amazing layouts feel like the house of your dreams. This project provides you with a 100 acres expanse consisting of many admirable facilities, especially for those who have a keen on sports. There a nine-hole golf course to practice at for aspiring golfers. Other sporty residents may use the grand and fancy sports arena or refresh themselves by exercising at the state-of-the-art gymnasium. Swimmers will find heaven here. There are two huge blue swimming pools present here. One of them is a professional, high-quality Olympic sized pool. The other is an indoor heated pool to take a dip even on rainy or cold days. You could also experience a blissful and enriching treatment that provides you with relaxation at the luxurious spa or at the salon. The price is highly affordable at 1.50 to 3.40 crores. The first factor that affects your choice of property is how spacious the interior of the house is. Well, these apartments are the perfect choice to opt for if the area is your priority. The area ranges from 2544 sq. ft. to 5335 sq. ft. All of these offer grand 4BHK luxurious sets of villas that are unmatched across the whole of Noida. Another high-class feature is the interior finish that truly is incomparable and beyond what you could imagine! This includes an array of well-designed inbuilt facilities provided in the house that are determined to glorify your living standards. Some of these are plush and private elevators, a designer kitchen with magnificent appliances provided and the beautiful flooring of Italian marble in various parts of the house. The rooms are also well-designed and huge and the living room is also no exception. Therefore, do not miss your chance and book your apartment here today!